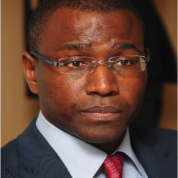 Amadou Hott serves since 2013 as founding CEO of FONSIS (Sovereign Wealth Fund of Senegal) which manages government assets and invest in projects. He is a Special Adviser of HE President Mack Sall and was Chairman of AIBD, Senegal’s new international airport project. Prior FONSIS, Hott spent over 15 years in investment banking (New York, London, Dubai, Lagos) and at UBA Capital Lagos where he was CEO.As a volunteer, Hott is a member of the Selection Committee of the USD 100 million Tony Elumelu Foundation African Entrepreneurship Programme. Hott was twice a volunteer of the UN’s TOKTEN program teaching finance and mathematics at University Gaston Berger of Saint Louis (Senegal) in 2004 and 2005. Hott was nominated Young Global Leader by the World Economic Forum in 2012.He holds Bachelor and Master’s degrees in economics and finance from Paris Sorbonne, and was an exchange student at New York University.